The building style is modern, exhibiting a state of simple grace and elegance. 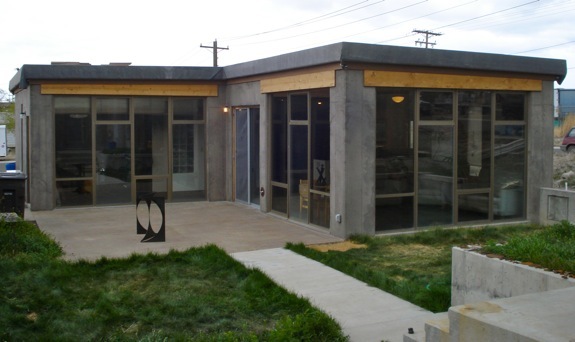 This owner-built passive solar home utilizes concrete as its priniciple building material. The southern side of this concrete home is dominated by windows. Concrete is a dense material that can absorb, store and radiate heat. Concrete is a material with thermal mass. The thicker the material with thermal mass, the more potential mass can be utilized to act as a temperature stabilizer. 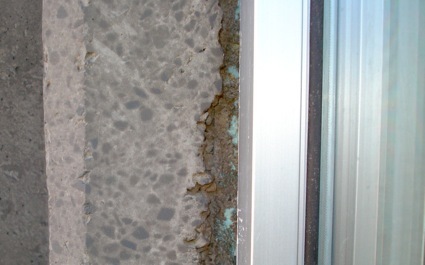 A close up that shows the cement around a core of blue insulation. The sliding door is to the right side of the picture. 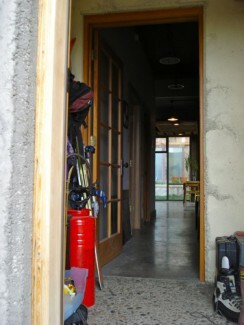 The sliding door can be seen in the picture above. The home is built with concrete that is sandwiched around a core of insulation. The owner-builder believes that this is the best wall system to keep a constant and stable temperature. A typical building will use insulation as a means to prevent temperature exchange. 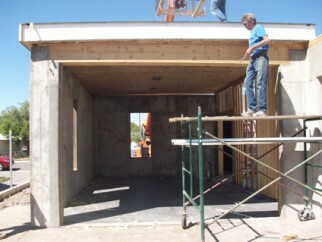 As an example, a stick frame house uses layers of insulation between the 2 x 4s. 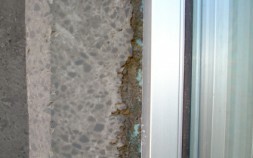 Within this concrete wall system, the insulation is also located in the middle of the concrete wall and functions to slow the transfer of heat. Sandwiched between the outer layers of concrete is 4 inches of extruded polysterene (blue board) insulation. Along with other technologies that work together, passive solar houses are engineered to be cool in the summer and warm in the winter. 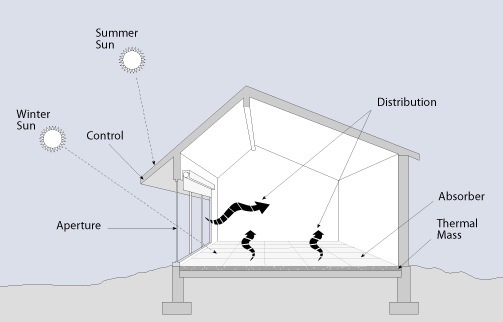 Here’s how basic passive solar design works. On a cold, but sunny winter day, because the windows are situated on the southern side of the home, the house absorbs the sun’s heat energy throughout the day and stores the heat within the thermal mass of its floor and walls. After the sun goes down, the structure will naturally radiate the heat that it stored throughout the evening and night. Inside the windows, the living room has a seating area on a gleaming, concrete floor. 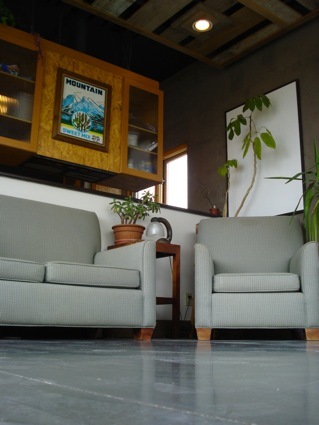 Notice the concrete floor in the living room. The room sits just inside of the southern windows. 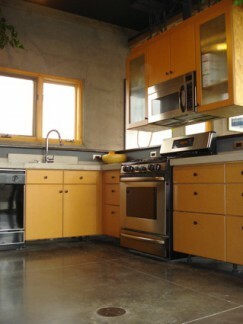 Both the floor and the walls are made of poured concrete and have the potential to store solar heat. During the summer, because the sun travels a higher arc in the sky (photo comparison of the sun during the winter and summer solstice) the sun’s heat is blocked from entering the home. As a result, the density in the thermal mass stays cool. In the evening, the home can be opened up to the cooler night air. This house does not have a mechanical cooling system. The home is built in Montrose, Colorado, where the temperature in the summer regularly reaches into the 90s, yet on the hottest summer day, the house warms only to about 75 degrees Fahrenheit. In the winter, while the temperatures can dip below zero, the average temperature on the coldest days is around 65 degrees. The owner’s highest heating bill was $84. The north side of the house is typically the coldest as it is in the shade. The house is heated exclusively with electricity. Built on a 5 inch concrete slab, the house also has in-floor radiant heat with an electric flash, on-demand water heater. 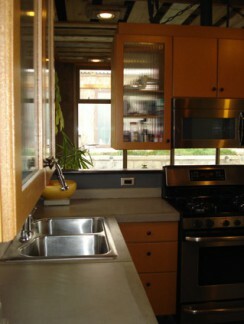 Because it is a passive solar house, the north facing side of the house has only two windows and a door. Objects with a high amount of thermal mass, such as concrete, inherently work to slow the rate of heat transfer. The dwelling resists rapid temperature swings because of its mass. 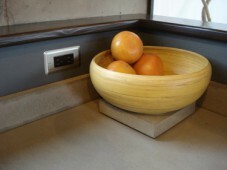 Here are a few other pictures that show the use of concrete and other details of the house. A Structure Insulated Panel System was used for the roof of the home. Keya–What a great article! I especially enjoyed all the photos. They really help illustrate what you are saying and they make the house look good. Thanks a lot. 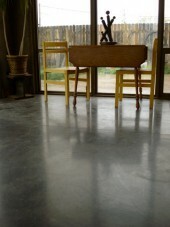 What did you use to make concrete floor in living rooms to look shiny? Great home!!! 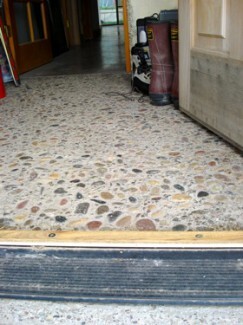 I asked the builder and he said that a combination of things made the concrete floor look shiny and so striking. When the floor was poured, it was hand troweled to give it that ultra smooth finish. After it dried, they used a high gloss sealer to finish and protect the floor. It was also cleaned just prior to the pictures being taken. Matthew – the builder would be happy to build you one. I Really love the use of concrete in the construction, it’s such an underrated material. 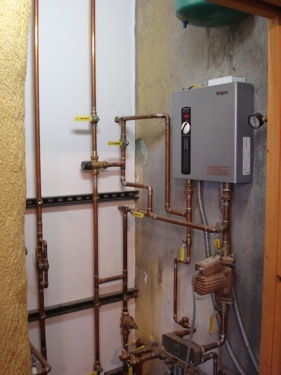 Where can I get more info on the water/glycol system you guys used for the solar heating system? The link is to an article on a grid-tied house that integrates both solar photovoltaic film and solar evacuated tubes – that use glycol to tranport the solar heat into a water tank / heat exchanger. It is similar to the system that is used in the concrete house, but goes more indepth in the explanation of how the glycol and heat exchange takes place within the water tank. Now that you have lived in the home a few years I’m wondering how often the radiant heat floors are used? I hope to build a passive solar home this summer. I wanted radiant heat tubing put in the concrete floors, but have been reading that radiant heat can over heat the house. That it is better to use that money on other things such as more insulation, etc. How would you respond to that? I emailed the owner of this house and asked him to follow up with your question. In the meantime, here are two houses that have radiant in-floor heat. They both are located in cold, mountain climates, in sunny Colorado. 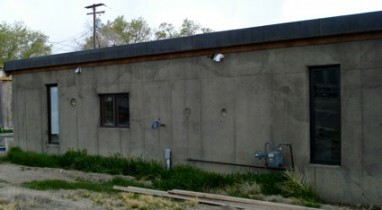 This one is grid tied – http://greenpassivesolar.com/2011/01/net-zero-pv-log-home/. It uses solar thermal to both heat hot water for domestic use and for heating the home. In the case that the system gets too hot, for example, in the summertime, the heat sink (heat dump) was plumbed to the garage and not to the living areas. This might be something to consider. Best of luck to you and your build! Keep in touch. Susanne, the cost of installing tubing in the floor is minimal and gives you an easy and flexible way to control it’s temperature. It’s also a simple way to prove a back-up heating source to satisfy a mortgage lender’s requirements if you (or a future buyer) need financing. Does Sven sell plans of this great house? I think so. I asked him to get back to you, but was not sure if he emailed you directly, or would post here… Let me know if he doesn’t get back to you. This is a great house design! I lost my house to a fire last January and I decided to rebuild with concrete. I’ve been looking all over the internet for house plans that don’t cost an arm and a leg and I certainly can’t afford an architect. 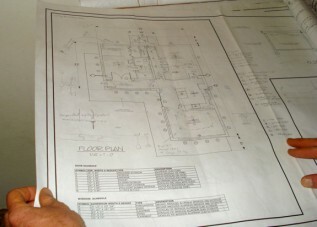 Would Sven be willing to sell a copy of his blueprints? Sorry to hear that you lost your home to fire. I’m trying to get in touch with Sven. I think that he would be able to sell a copy of the blueprints. Hopefully he’ll be able to get in touch with you soon! Thanks for this article. My wife and I are trying to build a concrete home in Texas but we are having difficulty with design work and finding builders competent for the task. We are reaching out to others who might be able/willing to help get this project started. I would love to contact the owner and/or builder for some much need advice. I talked to the builder and he’s open to talking. I’ll email you info. Thank you, this is awesome. Will you forward my email to Sven. I would appreciate more info on the process. Sure, I’ve forward it to him. He does consultations as he did a lot of problem-solving when building this house. This is an awesome house. What is the approximate cost to build something similar? I think it was around $150,000. Hi, I was looking for passive solar plans, and I usually find huge houses. This is the best so far! I couldn’t find how many bedrooms are. Can’t see the floorplan well. And my second question is, as I live in South America, wich sun goes to the lateral window on the north side (morning or afternoon?) Thank you so much for this post! How do we find house plans & a builder for a home like this in upstate New York? Any information is *greatly* appreciated! You might want to try a google* (or any other search engine) for “concrete home builders upstate new york”. That might be the most efficient way, beside word-of-mouth and asking around your local area. My apologies, I don’t know any upstate New York concrete home builders. This is a two bedroom, one and a half bathroom house. You’re welcome! If living in South America, because you are in the southern hemisphere, in order to receive full sun, the windows should face the north, instead of the south. As for specificity on solar movement in lateral windows, that’s specific to location on the globe, and depends upon both the window size and location, as well as the size of the overhang. Here are some links to homes built in the southern hemisphere, specifically in New Zealand. Thank you so much for sharing. I would certainly be interested in getting a copy of the plans. How would I get in touch with the builder? Thanks again. I believe that he’s selling a copy of his plans. I’ll forward your email address to him. Awesome active / passive solar designed home. Two quick questions if I may. 1. Understand I maybe delving into an issue that may not apply or is comfortable. Understand if no answer. Did the designer / builder homeowner (?) obtain conventional financing for the build. 2. Strongly interested in obtaining a copy of the house plans. Know this was asked above. Does Sven sell the plans? How do we get in contact with one another? Leaving CA after 42 years for (hopefully) a more “progressive” environment. Taos, New Mexico. CA is not “progressive” as to anything other than a conventional 2 by 4 build. Read not Earthship, Hay, Tiny Home (THOW’s are permitted in only 2 locations in all of CA. Tiny Home on a foundation is only permitted as mother-in-law or secondary residence, not primary), Yurt or Wofati. I’ve contacted Sven to see if he has the plans available. He’ll respond here, or he’ll let me know and I’ll get in touch with you. Thanks!